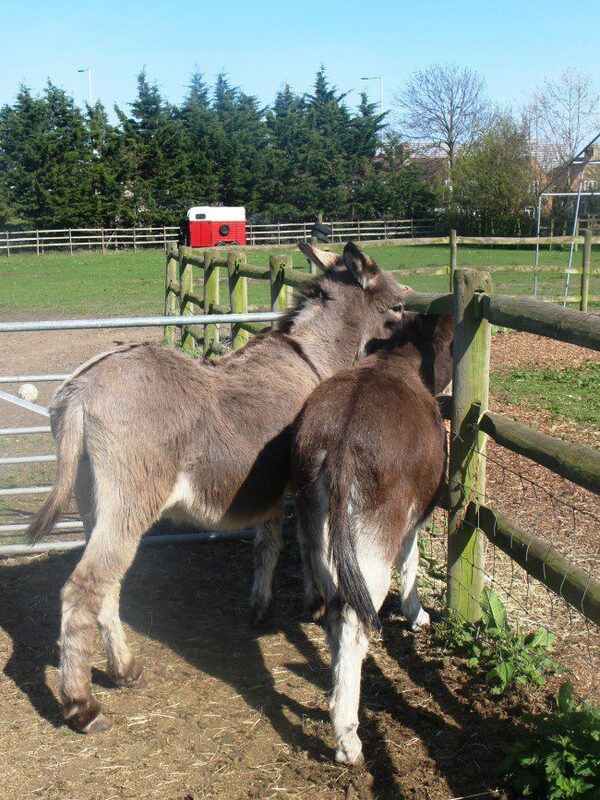 A sunny afternoon calls for a new adventure, and on this gloriously sunny day, we drove about 20 minutes over to the Hounslow Urban Farm to explore and meet the animals. It was adorable to see Little T’s face light up with recognition and a big grin when he caught sight of the animals he typically sees in his books or toys, in particular the pigs, chickens, roosters and sheep. 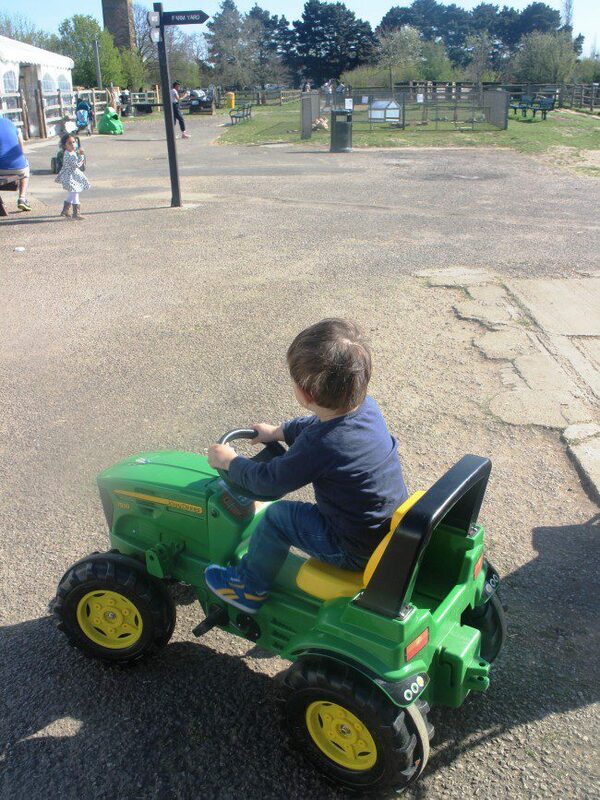 I knew the moment I saw kids riding around on tractor toys just after the entrance that we wouldn’t be progressing much further into the farm unless Little T was on one. Fortunately, just after the ticket counter, I was able to find an available one in the large tent, where there is also a bouncy castle and a play area. 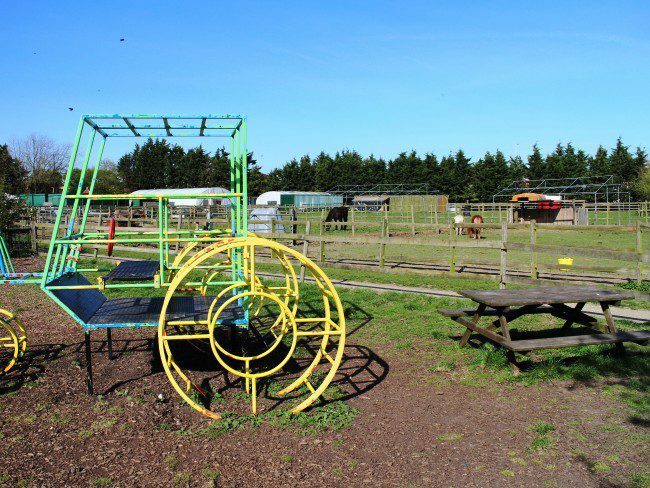 The ride-on toys are a fantastic way for the little ones to enjoy the farm. 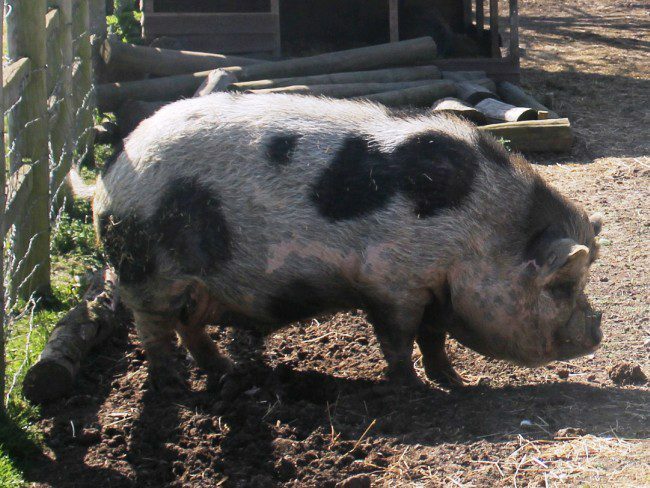 This large pig caught Little T’s eye and he was grinning from ear to ear (and snorting) when he realised what it was! The pig came right up to where we were standing, sniffing the ground near the fence, and Little T bent down to wave hello – it was definitely one of the highlights! This pen was in a separate area of the farm and, with the large tires placed about like an obstacle course, it looks like where they have the pig races! 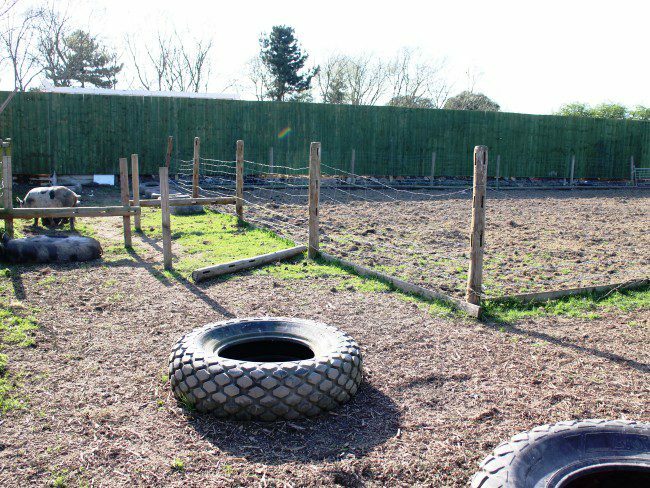 Have a look at the Hounslow Urban Farm activity timetable if you’d like to be there when it happens. And the sweetest looking ponies also grazing nearby. 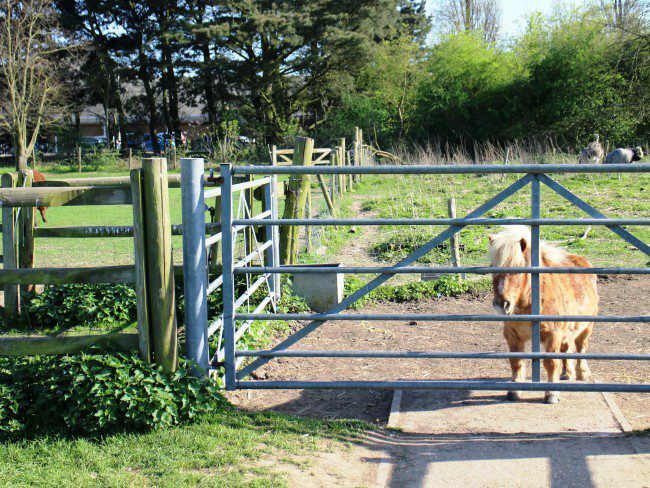 Hounslow Urban Farm offers pony riding throughout the school holidays, and on Monday, Friday, Saturday and Sunday during term times. On those days, the sessions are 11:00-12:30 and 2:00-3:30. We missed out this time, but I’ll make sure that we come back when they have a pony riding session to see if Little T would like to give it a go. The cost is £3 per child and a set weight limit for riders of no more than 30 kg. Riders are fitted with a riding hat and are led by an experienced member of staff around a bark track in one of our paddocks for 2-3 minutes. For slightly younger riders, an adult must accompany them throughout their time on the pony. 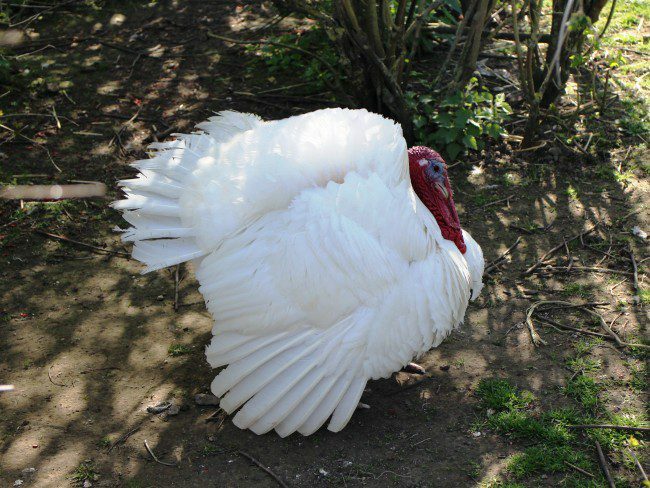 A white turkey waddling around caught Little T’s eye… Turkeys are pretty amazing to look at with their hefty size and plumage, I can see why Little T was intrigued! 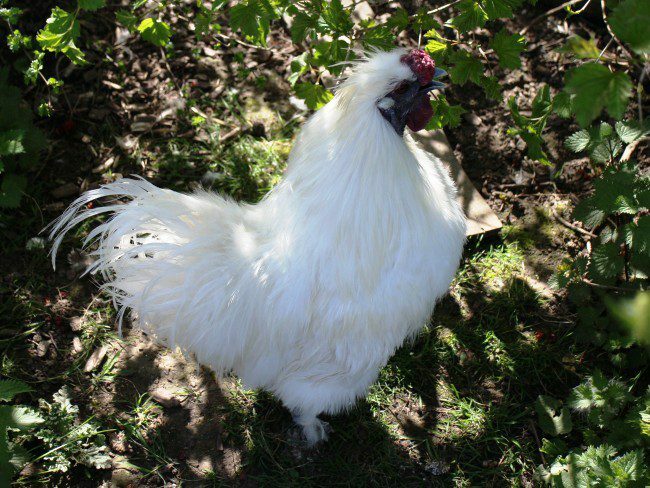 The turkey’s neighbor, a rooster, was also of interest with its characteristic crowing. Then came across another pony, looking sweet and friendly and just as interested in all the visitors passing by to say hello. And then he spent loads of time in these bumper boats. 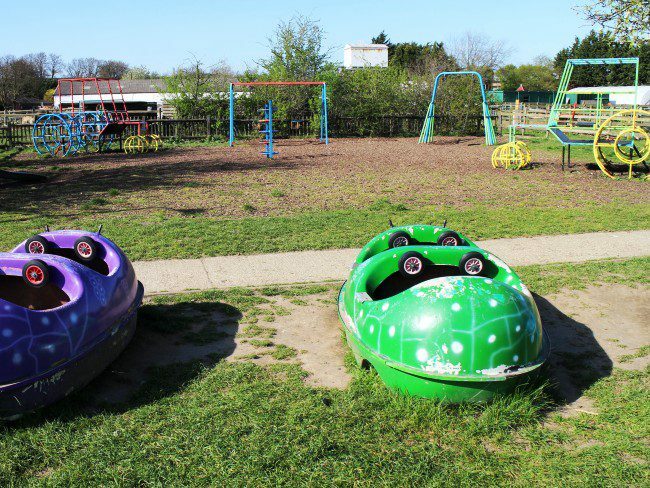 Actually most of the time we were in this playground was spent here, moving from one to the other, turning each steering wheel, one by one and back again. There are plenty of picnic tables in the playground area, with soap and a sink right at the entrance gate to wash up especially if you’ve touched any animals. 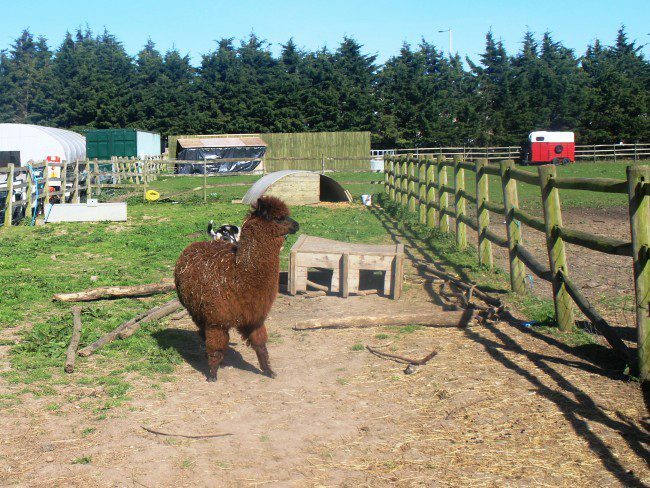 Hounslow Urban Farm was a pleasure to visit for Little T’s first farm experience! 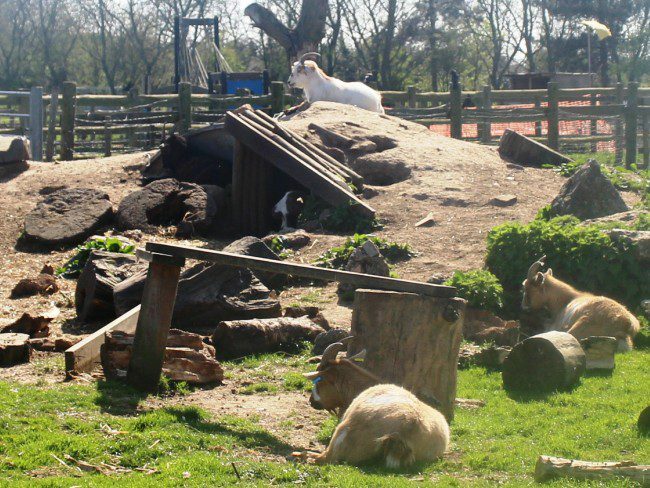 It’s well taken care of, there is a good mix of animals to see, the ride-on tractor toys are a nice touch, the staff are friendly and there are creative opportunities to interact with the animals throughout the day. 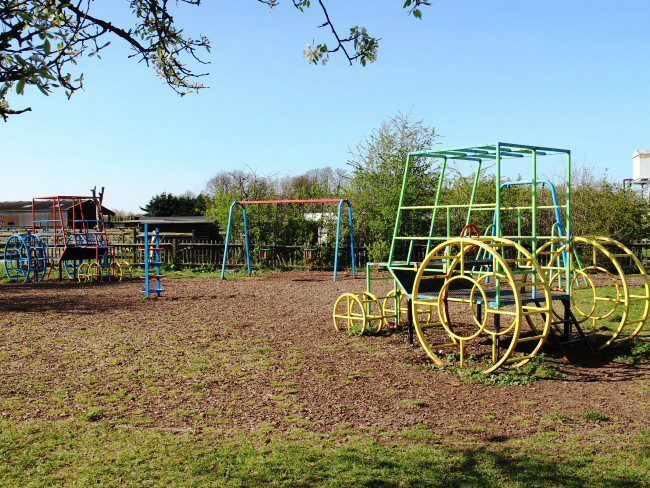 For us, two hours was a good amount of time to make our way around the farm, with a long stop at the playground which, as I mentioned before, Little T thoroughly enjoyed. I didn’t use the bathroom facility or check what the café offers. 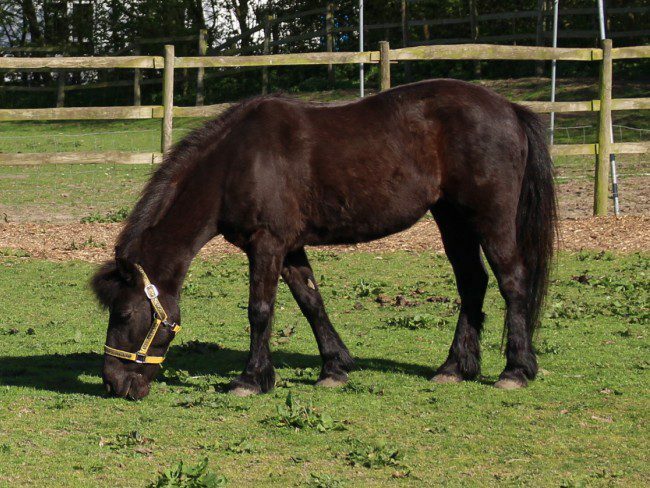 Hounslow Urban Farm offers pony riding throughout the school holidays, and on Monday, Friday, Saturday and Sunday during term times. On those days, the sessions are 11:00-12:30 and 2:00-3:30. Opening hours: 1000 – 1700, Monday to Sunday. Last entry 1600. Closed Christmas Day, Boxing Day and New Year’s Day. Parking: Parking is free, in a large grassy lot that is right in front of the farm entrance. Tickets: Adult tickets are £7.50, children 2+ years tickets are £6.00, children under 2 years go free. You may want to leave the stroller behind if your toddler is walking around on his/her own and likes to use the ride-on tractor toy. Little T was either running around to look at the animals or being pushed around on the tractor, so we ended up not using the stroller at all, but it of course depends on your child. Bring a small cloth or hand towel, in case they’ve run out of paper towels at the hand washing station. 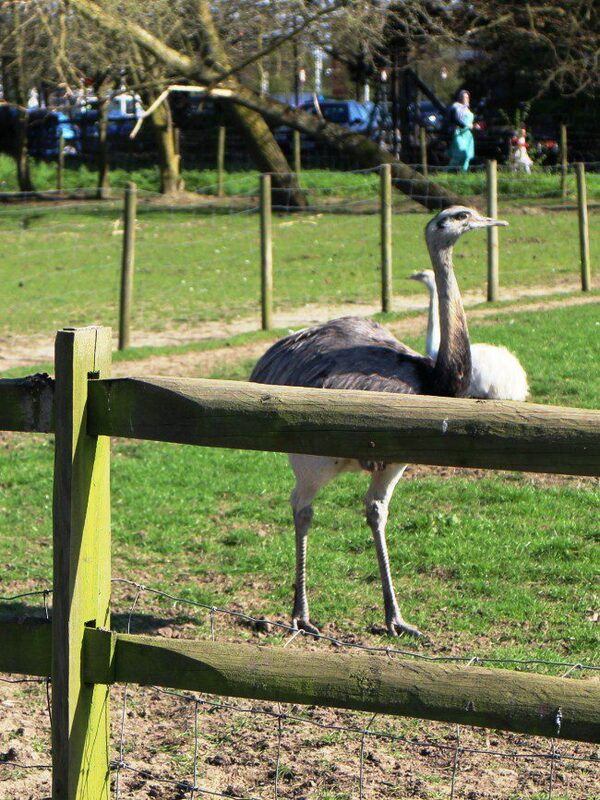 Make sure to check out their activity timetable for scheduled animal encounters, including pig races and owl displays. 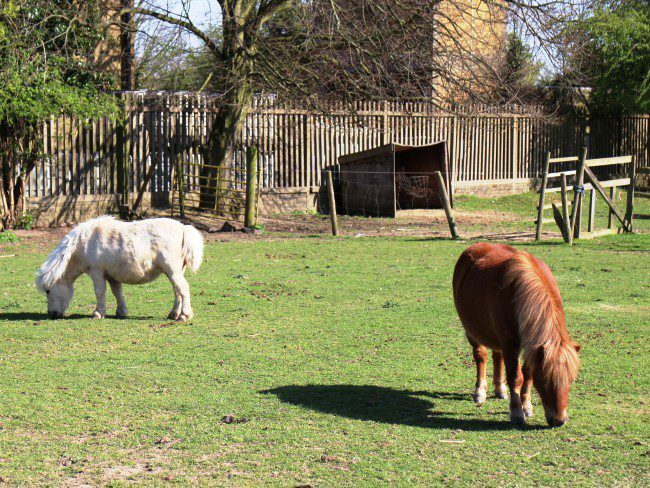 Hounslow Urban Farm offers pony riding throughout the school holidays, and on Monday, Friday, Saturday and Sunday during term times. On those days, the sessions are 11:00-12:30 and 2:00-3:30. Pony rides are £3 per child and last 2-3 minutes.